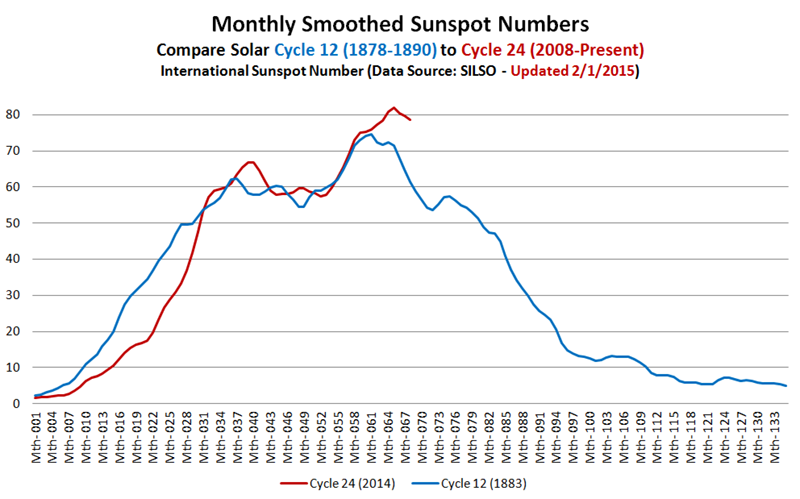 Solar Cycle 24 Update for February 2015 | Watts Up With That? Solar cycle 24 contines to be lower than the vast majority of predictions that came out during the waning years of solar cycle 23. David Archibald gives an update on the current progress of solar cycle 24, showing that it remains quite low, and under-performs almost all of the “official”predictions based on models and other forecasting tools, some of which claimed as late as 2006 that cycle 24 would be 30-50% stronger that cycle 23. 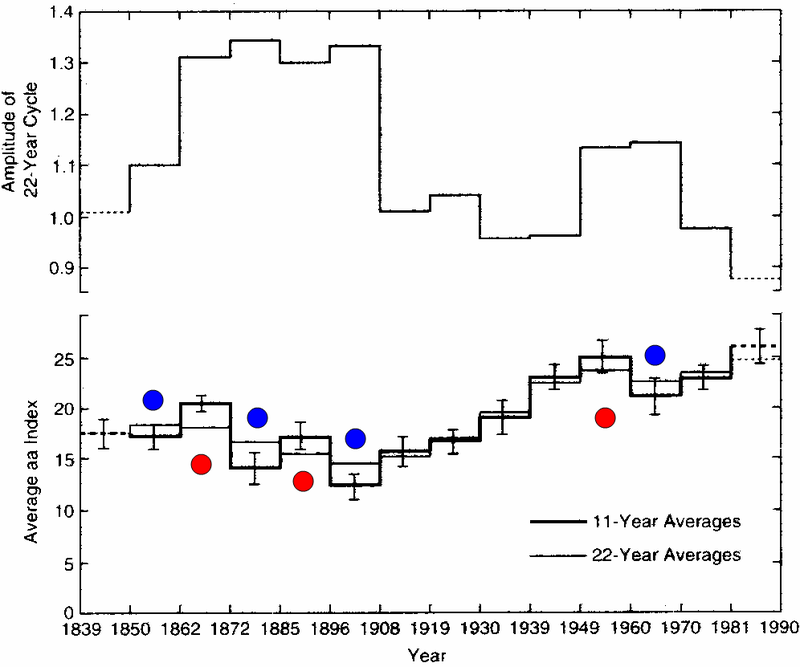 So far, solar Cycle 24 has been most like Solar Cycles 10 to 15 which started in 1855 and ended in 1923. It is noteworthy that solar cycle 10 produced the famed Carrington event, which if it occurred today, would likely wreak havoc with our sensitive electric grid and electronics. Guest essay by David Archibald. Solar Cycle 24 has been stronger for longer for about a year now. 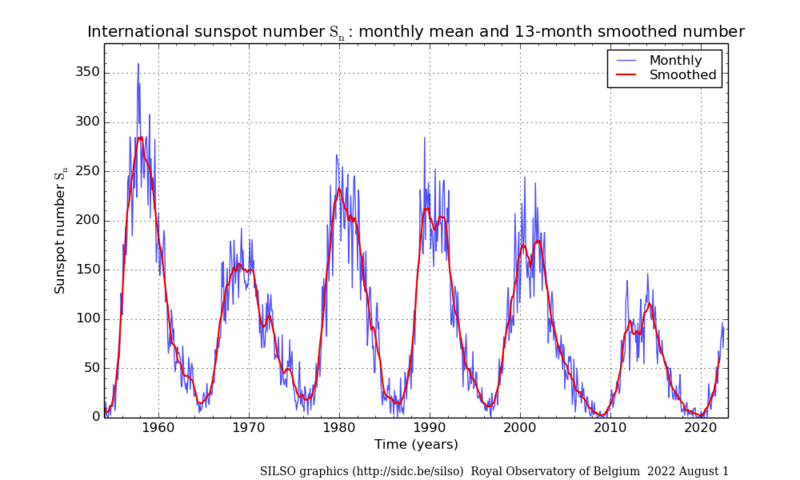 This plot of sunspot number that decline from the second peak is underway. The Ap Index, a geomagnetic index driven by the Sun’s magnetism and the solar wind, remains at levels of previous solar cycle minima. From Jan Janssens’ website Solaemon, this graph plots the Ap Index with sunspot area from 1932. Absolute lows in the Ap Index correspond to solar cycle minima but the peak in the Ap Index can be much later than peaks in the solar cycle. 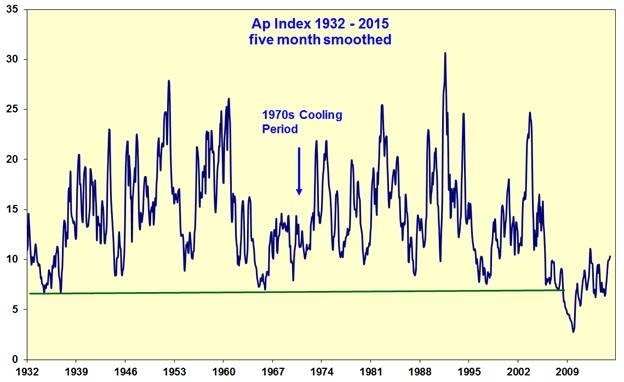 Note that the Ap Index was quite strong during the 1970s cooling period up to the Solar Cycles 20/21 minimum. 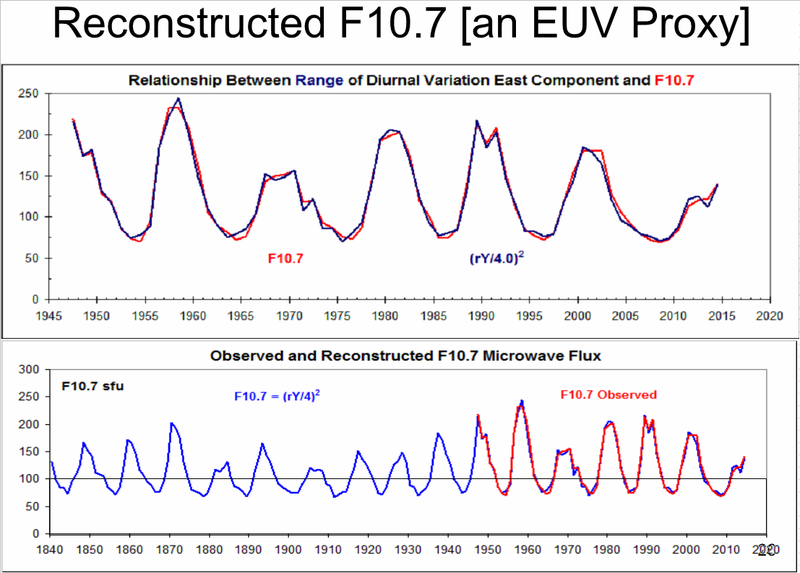 The F10.7 flux is not subject to observer bias and thus many prefer it to the sunspot number. 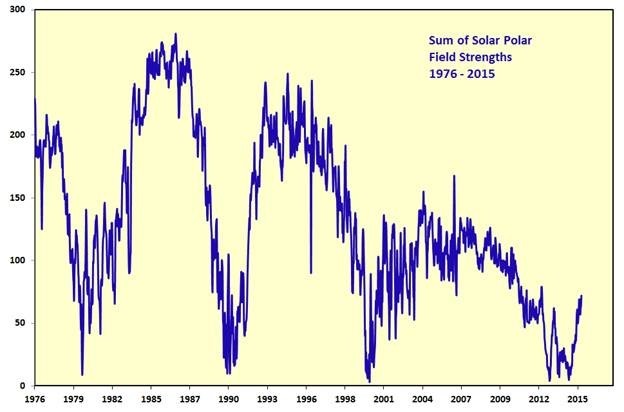 This chart confirms a second peak in Solar Cycle 24 over the last year. A F10.7 flux above 100 is warming, below 100 is cooling. So the last few years have put a little pulse of warming into the climate system. The heliospheric current sheet tilt angle flattens at solar minimum. For the Solar Cycle 23/24 minimum, that occurred in October 2009. From that minimum, the tilt angle had the fastest ascent of the instrument record which happens to be only three and a half cycles. The peak in the tilt angle this cycle is also the broadest in the instrument record. If that means anything, it possibly means that there is not much drive behind it. 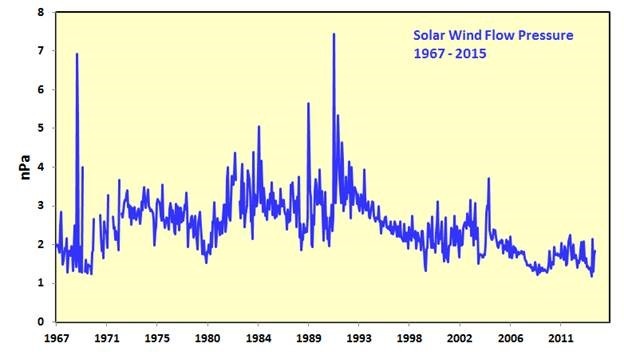 This graph shows a rise from the low in the late 1960s to the peak at Solar Cycle 22 maximum and then the 23 year decline from that peak. It is this flow that modulates the flow of galactic cosmic rays in the inner planets of the solar system. Galactic cosmic rays produce a continuous shower of neutrons in the lower atmosphere. The climatic significance of these neutrons is that they provide nucleation sites for cloud droplets. Clouds in turn reflect more sunlight than land or open ocean, cooling the planet. The neutron count follows solar activity with a lag of about a year, reflecting the time the solar wind takes to get to the outer parts of the solar system. This data is from the Wilson Solar Observatory and thanks to Dr Hoeksma for updating the data. As with the broad top in the heliospheric current sheet tilt angle, there appears to be a broad top and not much energy in the system. 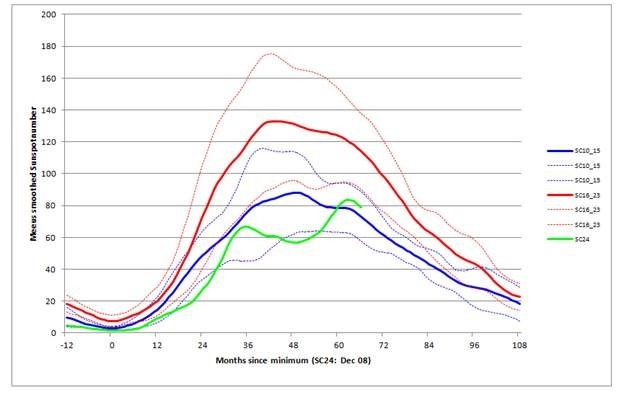 Also from Jan Janssens, this figure shows Solar Cycle 24 (green line) compared to the averages of Solar Cycles 10 to 15 (solid blue line) and Solar Cycles 16 to 23 (solid red line). 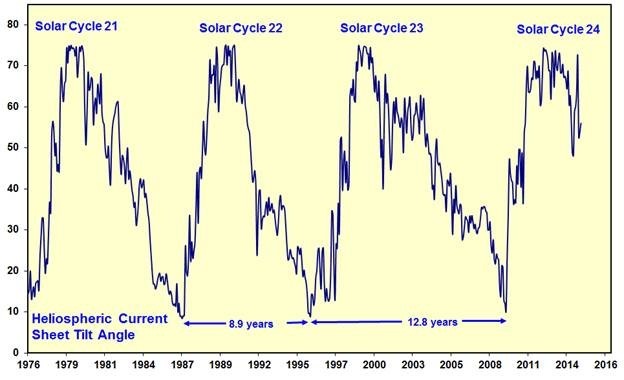 In terms of analogue cycles, Solar Cycle 24 has been most like Solar Cycles 10 to 15. 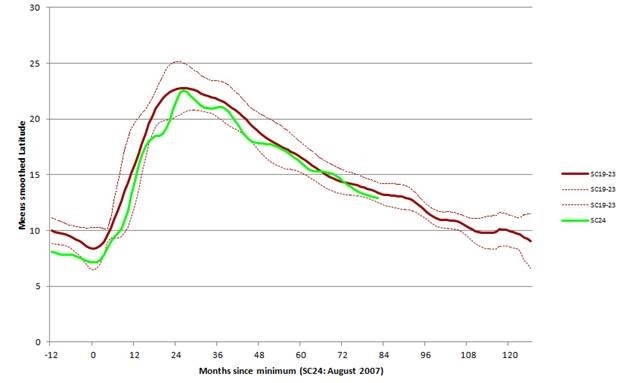 Yet again from Jan Janssens, this figure shows the sunspot latitude of Solar Cycle 24 (green line) compared to the average of Solar Cycles 19 to 23. Note for the purpose of this graph, a different month of minimum is used. In this case it is August 2007. This graph is important in that it shows that Solar Cycle 24 is no faster or slower than the previous five cycles. That does not preclude Solar Cycle 24 from becoming a very long cycle if the tail includes a period of no sunspots. David Archibald is a visiting fellow at the Institute of World Politics in Washington. His most recent book is Twilight of Abundance (Regnery, 2014). February 15, 2015 in Climate News. I keep telling everybody that those dudes in the 70’s had it right. There is no evidence for that, see e.g. The lower values don’t seem to vary much but at first glance there would appear to be a warming/cooling link if the peak is above or below 150. Is there a possible link? Solar Cycle 24 has been stronger for longer for about a year now. This story predicts that as a result of Global Warming there will be droughts in the US southwest due to lack of El Ninos. What may actually happen is that there will be no El Ninos not because of Global Warming but because of low solar activity. Then the droughts will be blamed on, who else? Nasty humans and their poisonous CO2. David Archibald: As always, extremely useful material. David, since you have a very effective way of explaining your material it would be nice to see a more general decription in your words on the nature of the different parameters. For example, if you explained the nature of the tilt data im sure all – including me – would get the picture of why this parameter is scientifically interessting and important. The sun has an impact, the question is what is the real impact of sunspots. Some information for your own evaluation. I think Archibald wants low solar activity to support his cooling predictions, but uses Ap fig2 , which is geomagnetic storm index driven by solar wind. Fig5 solar Flux reflects true solar activity, which not much different than sc20. If low solar drives cooling why doesn’t it get cold during the minima between the cycles? I.e. no sunspots then! In the shorter term, slower solar wind correlates well with negative NAO/AO and El Nino episodes/conditions. If the declining solar plasma pressure/density since the mid 1990’s is responsible for the strong warming of the AMO since then (by increasingly negative NAO increasing poleward ocean transport), the global mean surface temperature would naturally increase its warming rate for a period. Because of oceanic negative feedbacks, there should be no direct relationship between the solar wind and the global mean surface temperature at inter-decadal scales. And why have you adjusted the Ap so high around 1870? I would expect to see a couple of warmer years on CET there if that were so, but there’s no sign of it. The 1866 to 1874.5 adjustments look ridiculously high, I don’t buy it. It doesn’t matter what you buy. The upwards adjustment is a fact and is accepted by the most ardent critics of my work. As there is no demonstrated relationship between Ap and temperature, it is not surprising that you don’t see any. Makes sense. That would be similar to saying that Average Global Temperature is directly proportional to CO2 concentration. Rather than these short term cycles which many agree indicate a Dalton like Minimum … I am interested in the Milankovitch Cycle. On popular science documentaries I’ve heard the claim it will be 40,000 years until the next glaciation phase in the million plus year ‘ice age’ we live in. The more reputable person suggested precession entered a phase where the tilt range put us back into the cycles prior to the previous 5 cycles where the interglacials were 50 or 60 thousand years instead of 10 thousand years. I have yet to see this topic addressed directly however. As for the current “Dalton Like Minimum”, our advances in a whole range of technologies will mitigate most of the cooling and the contaminated surface data (UHI) will disguise much of the trends so that it is looking more like the ‘Climate Change’ movement will morph into an ‘Energy Tax’ movement without skipping a beat and once again the advance in technology subsequent average ‘standard of living’ will disguise the economically destructive activities of government. In summary, we can afford to purchase our illusions (a luxury good per say) and it will take a long time before we decide to know the truth, if ever. Thanks for keeping the discussion out there though. Not a lot is right here. Yes the curren ice age is a million year plus – about 2.5 million years. There hasn’t been 5 long 100 000 year cycles – the correct figure is 8. The cycles before this time weren’t 50-60 thousand years – they were 40 thousand years. OK, so I didn’t get the Neogene or whatever right off, now I’ll have to research the 8 cycles although it’s been 10 years since I’ve dug through this stuff. The information about the previous time previous to this is thin as I presume its based on the margins of glacial tills not over-ridden … but OK, I didn’t remember which was longer, the interglacial or glaciation which gives one or the other 20 thousand years …. I just have to say … so what … now that we have the details are out of the way, are we in a new glaciation? … or has something changed as suggested vaguely in a few scientific documentaries. I appreciate the technical corrections, but you didn’t answer the big question. Do we have 10’s of thousands of years to the next glaciation, or is it just a Heinrich Event away, which from what I’ve seen we don’t understand very well. Apologize for not using Quatenary Period. Quick search with some clues inspired here and found … “More recent work by Berger and Loutre suggests that the current warm climate may last another 50,000 years.” OK, now I have something interesting to look at. “An Exceptionally Long Interglacial Ahead?, A. Berger, M. F. Loutre (2002)”, given the date, I must not have been that interested in the past. http://www.sciencemag.org/content/297/5585/1287 Appears to be universally referred to … by the way your 40 thousand year assertion is incorrect, there is no correct answer as it gets quite messy although less drastic in deviation from mean. Also there were not 8 ‘long Milankovitch Cycles’, there are 10 documented ones with a cursory glance with 4 being somewhat like the last. You did get the 2.5 million years close enough however. SO much hand waving (and economic destruction) for one 20-yr period (1978-1998). Holocene is 11.5 k yrs and counting with hundreds of 20 to 30 yr up/downs (climate change?). Holocene is the 52nd ‘warm period’ of the Quaternary (104 MIS with 52 cold periods followed by 52 warm periods) and that’s IF we agree that the Quaternary started at 2.58 my (just as easily to claim that it started 3.1 my or 3.4 my based on MIS data set). Since 1950, we’ve gone from 4 Gtons of atmospheric carbon loading annually to the current 38 Gtons of carbon loading, yet in those 65 years, we’ve experienced only 20 years of ‘warming’, yet still “debate” the CO2, GHG meme. Two references, Andre Berger calculated that the analogue to the present Holocene interglacial is the interglacial 400,000 years ago, Marine Isotope Stage 11. Various estimates give sea level during MIS 11 as high as 20 meters above the present, 66 feet. Now if one looks at this chart(in the above) the bottom one with the blue temperature curve and compares it to the latest study showing the solar secular cycle one will see a good correlation between global temperature and the solar secular cycle. The solar secular cycle trend from 1610-2010, and the absolute values of the solar secular cycle trend correlating with the global temperature trends (1610-2010), and absolute values of the global temperature. The solar secular cycle trend also shows a distinct increase in solar activity from the period 1930-2005 period, versus the period from 1650-1930 in that the solar secular cycle through out that period of time never exceeds 125 ,in contrast to being above 125 from the 1930-2005 period of time, with a peak of 160! 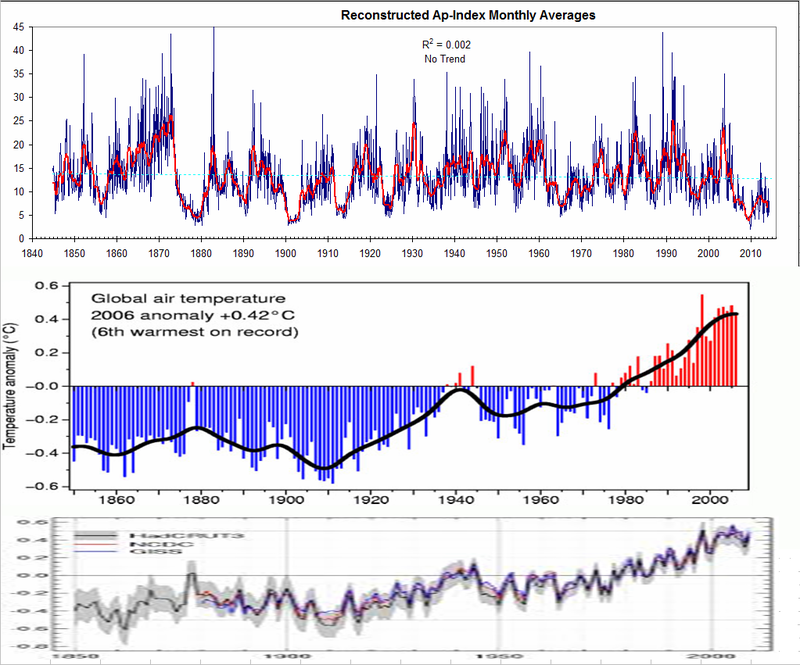 In addition if one examines the data, at times when the solar secular trend breaks 100 on the down slide the global temperature trend is down although the global temperature value starting points may differ most likely due to other climate items superimposed upon the global temperature trend such as the state of the PDO,AMO or ENSO. 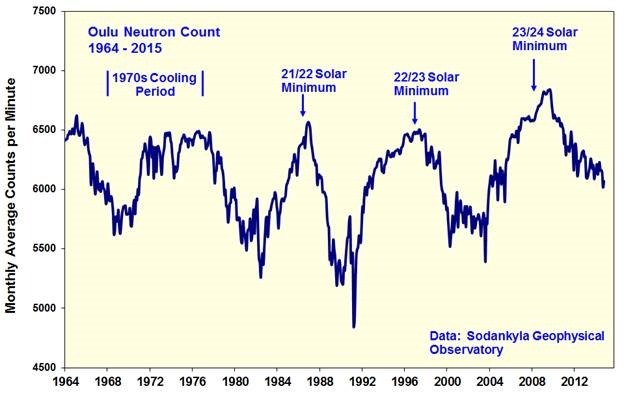 During the times when the solar secular trend broke 100 those being the period 1660 -1720 and 1780-1830 both corresponding to the Maunder Minimum and Dalton Minimum ,the global temperature trend is in a definitive down trend. In addition even from the period 1880-1905 when the solar secular cycle approaches the 100 value, the global temperature trend is slightly down once again. Then on the other hand, when the solar secular cycle trend exceeds 125 from 1930 -2005 the temperature trend is up and shoots really up when the great climatic shift takes place in 1978 which is when the PDO ,shifted from it’s cold to warm phase. The data from the above shows quite clearly that when the solar secular cycle breaks 100 on the down slope look for a global temperature cooling trend to begin from what ever level the global absolute temperature is at, and when the solar secular cycle rises and breaks through 100 on the upside look for a global temperature trend to rise from what ever level the global absolute temperature is at. A general rule I see is when the solar secular cycle exceeds 125 global temperatures trend up or are at a higher level and when it breaks 100 on the downside global temperatures trend down or are at a lower level. If this latest solar information is correct and that is a big if ,but if it is correct, it shows the climate is more sensitive to primary ,and the secondary effects associated with solar variability. In addition my low average value solar parameter criteria for cooling may be able to be adjusted up some , due to this latest information. One last note, it looks like around year 2010 the solar secular cycle trend finally broke 100 on the down swing which would be the first time since 1830, when the solar secular cycle broke 100 on the up swing and had since stayed above that level until year 2010. THE GRAPH SHOWING THE SOLAR SECULAR CYCLE IS ON PAGE 13 OF THE PDF I HAVE SENT . LOOK BELOW. Now as far as solar flux values cooling should set in when that reading exceeds sub 90 but with the latest data which has just been presented(if correct) I may have to increase that number. Neutrons are small magnets, although the sum of their electric charge is 0. Therefore, their energy is converged under geomagnetcznego field lines. In the northern hemisphere it is a northern Canada and central Siberia. The increase in of neutrons since 1990. Using planetary feedback formula devised and published more than 10 years ago, extrapolation suggested non-smoothed SC24 to peak at approximately SSN =80. At same time re-phased version tracks polar magnetic field with well over 90% accuracy. As before, the correlations are exceedingly poor. Have you got better or simpler one? No. OCCAM’S RAZOR states that a scientific rule interpreted as requiring that the simplest of competing theories be preferred to the more complex, explanations of unknown phenomena be sought first in terms of known quantities. Only hypothesis that are plausible need be considered. Crackpot theories don’t count. Sometime it takes a crackpot to shout “the emperor has no clothes”. Giordano Bruno was burned at the stake after proposing that the stars were just distant suns surrounded by their own planets, and moreover the possibility that these planets could even foster life of their own (a philosophical position known as cosmic pluralism). Now 400 years later we know he was correct. Actually, it also cooled during the 1950s – 1960s. Until ~1975 it was a negative PDO. I think the solar advocates may be making the same mistake of misattribution as the aerosol guys. It could be some sort of two or three way combo, I suppose. But I think PDO is the better explanation. Many who do not have a good understanding of the climate system are guilty of the following, which is why all the data they put up trying to show no cause and effect is misrepresentative. They have no understanding of the dynamics and the interplay of those dynamics. The problem with so many in climate science is that the scientist in this field try to prove their points as to what may or may not effect the climate with specific items, as if they are in ISOLATION, rather then in the context of the entire climatic picture. Again a given force and magnitude changes of that force which may impact the climate has to be taken into consideration with the entire spectrum of items that are exerting an influence on the climate at that given time ,along with the state of the climate at that given time in order to get a sense of what impact that specific force may or may not exert on the climate. This is why it is so hard to prove and show a simple cause and effect relationship between the climate and items exerting a force upon the climate even though it does exist. No need to guess at least one who you are referring to. As well as being “low” in various measures, this cycle also looks like it will be quite a bit longer than the average. Hasn’t that also in the past been correlated with cooler temperatures and does this hold up? lSvalgaard: I believe your arguments are closely tied to at belief that effect from Sun should be reflcted in Earth climate immideately rather than (logiccaly) on an accumulated basis. ONE (or just half) weak Solar cycle cannot be expected to cool down Earth Oceans over night. Only when more weak Solar cycles have been observed you can seriously question the role of the Sun if temperature development has not been affected. Indeed see Del Prete above. ONE (or just half) weak Solar cycle cannot be expected to cool down Earth Oceans over night. Perhaps – but I’m not sure we’d expect the oceans to continue warming either. There is another thing that puzzles me. David Archibald shows the 1970s cooling period on Fig 3 above. The implication being that the weak solar cycle 20 (which began in 1964) caused the cooling. 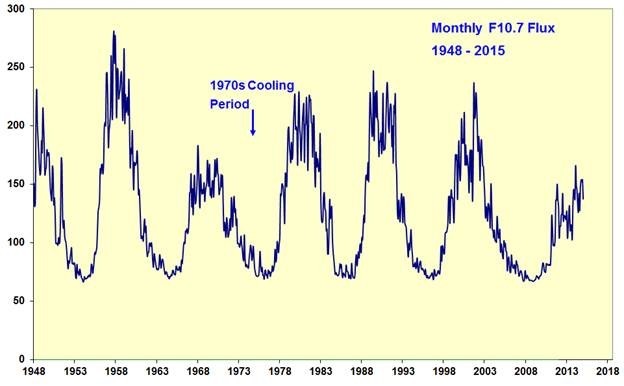 But the cooling actually began in the mid 1940s and ended in the 1970s. So, not only did earth’s climate respond immediately to solar cycle 20, it anticipated it 20 years before the event. I can see that this solar/climate link is pretty complicated. Sorry – should be Fig 4 not Fig 3. in above post. Yet Total Solar Irradiance from the Sorce TIM instrument has recently been in the 1,362.3 W/m2 range which rivals the peaks of solar cycle 19 (the largest one) in 1958 from its most recent reconstructions. TSI is relatively tame animal. Solar initiated geomagnetic storms are far more effective, colliding with the Earth’s magnetic field short term oscillations in the polar regions (particularly in the Arctic, where the field is split) modulates the high altitude atmospheric density, in turn interfering with polar vortex. Along the lines of Solar Secular Cycles and correlations with global temperatures we have SCD ,in the above graphs which is solar cycle deceleration. One can see very strong correlations. Look at the data. There were lots of weak cycles in the past. And you should really question Archibald here. “Launched in November 2013, Swarm is providing unprecedented insights into the complex workings of Earth’s magnetic field, which safeguards us from the bombarding cosmic radiation and charged particles. Newest model Earth’s magnetic field. Your above comment is misleading and appears to be disingenuous. It is a fact that solar wind bursts create a space charge differential in the atmosphere which through the process of electroscavenging changes the amount of high latitude clouds and changes the properties and duration of tropical clouds which in turn affects planetary temperature. Comment: There are multiple peer reviewed papers which I have quoted multiple times in this forum which falsifies your above comment and supports the assertion that I have just made. Solar activity, together with human activity, is considered a possible factor for the global warming observed in the last century. However, in the last decades solar activity has remained more or less constant while surface air temperature has continued to increase, which is interpreted as an evidence that in this period human activity is the main factor for global warming. We show that the index commonly used for quantifying long-term changes in solar activity, the sunspot number, accounts for only one part of solar activity (William: Closed magnetic field) and using this index leads to the underestimation of the role of solar activity in the global warming in the recent decades. A more suitable index is the geomagnetic activity (William: Short term abrupt changes to the geomagnetic field caused by solar wind bursts, which are measured by the short term geomagnetic field change parameter Ak. Note the parameter is Ak rather than the month average with Leif provides a graph for. The effect is determined by the number of short term wind bursts. A single very large event has less affect than a number of events. As Coronal holes can persist for months and years and as the solar wind burst affect lasts for roughly week, a coronal hole has a significant effect on planetary temperature) which reflects all solar activity, and it is highly correlated to global temperature variations in the whole period for which we have data. …. …In Figure 6 the long-term variations in global temperature are compared to the long-term variations in geomagnetic activity as expressed by the ak-index (Nevanlinna and Kataja 2003). The correlation between the two quantities is 0.85 with p<0.01 for the whole period studied. It could therefore be concluded that both the decreasing correlation between sunspot number and geomagnetic activity, and the deviation of the global temperature long-term trend from solar activity as expressed by sunspot index are due to the increased number of high-speed streams of solar wind on the declining phase and in the minimum of sunspot cycle in the last decades. Solar wind bursts create a space charge differential in the ionosphere which removes ions from high latitude regions and adds ions to the tropical region, with the return current moving through the ocean. This phenomena is called electroscavenging. See section 5a) Modulation of the global electrical circuit in this review paper, by solar wind bursts and the process electroscavenging. Solar wind bursts create a space charge differential in the ionosphere which removes cloud forming ions. As the electroscavenging mechanism removes ions even when GCR is high, electroscavenging can make it appear that GCR does not modulate planetary cloud if the electroscavenging mechanism is not taken into account. Observations of changes in cloud properties that correlate with the 11-year cycles in space particle fluxes are reviewed. The correlations can be understood in terms of one or both of two microphysical processes; ion mediated nucleation (IMN) and electroscavenging. IMN relies on the presence of ions to provide the condensation sites for sulfuric acid and water vapors to produce new aerosol particles, which, under certain conditions, might grow into sizes that can be activated as cloud condensation nuclei (CCN). Electroscavenging depends on the buildup of space charge at the tops and bottoms of clouds as the vertical current density (Jz) in the global electric circuit encounters the increased electrical resistivity of the clouds. Space charge is electrostatic charge density due to a difference between the concentrations of positive and negative ions. Calculations indicate that this electrostatic charge on aerosol particles can enhance the rate at which they are scavenged by cloud droplets. The aerosol particles for which scavenging is important are those that act as insitu ice forming nuclei (IFN) and CCN. Both IMN and electroscavenging depend on the presence of atmospheric ions that are generated, in regions of the atmosphere relevant for effects on clouds, by galactic cosmic rays (GCR). 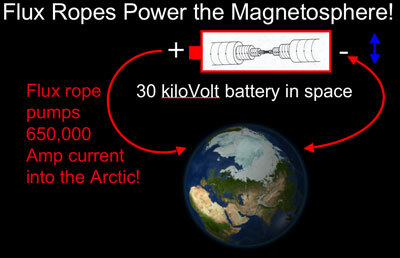 The space charge depends, in addition, on the magnitude of Jz. The magnitude of Jz depends not only on the GCR flux, but also on the fluxes of MeV electrons from the radiation belts, and the ionospheric potentials generated by the solar wind, that can vary independently of the GCR flux. The roles of GCR and Jz in cloud processes are the speculative links in a series connecting solar activity, the solar wind, GCR, clouds and climate. This article reviews the correlated cloud variations and the two mechanisms proposed as possible explanations for these links. The graph below shows the number of days with a geomagnetic storm per year and how strong those storms were. This will give you an idea in which years there were a lot of geomagnetic storms. Ren, is there anything going back to the previous two or three solar maxima like this? The sun has changed from an active mode (1850-2005) to an inactive mode post 2005, therefore making future solar predictions and even comparisons based on the active period 1850-2005 in my mind is very dicey. During Dansgaard-Oeschger or Heinrich cooling events, the jet stream speed increases which increases the amount of dust that is deposited on the Greenland ice sheet (the dust is coming from China). During a Heinrich event there is a hundred fold increase in dust deposited on the Greenland ice sheet. The recent observed changes: 1) Highest sea ice in recorded history in the Antarctic (starting in 2012), recovery of sea ice in the Arctic, and increased jet stream speed (starting in 2013) supports the assertion that what was inhibiting the solar magnetic cycle modulation of planetary cloud cover is now starting to abate. Stronger westerly headwinds for U.S.-bound flights are stretching out travel times, forcing some planes to stop for refueling. Trips such as London to New York, a busy business route, are running almost eight hours — 45 minutes longer than voyages in September. Two Philadelphia-bound American Airlines flights, one from Brussels and the other from Amsterdam, had to touch down on Jan. 11 to refuel in Bangor, Maine, said Scott Ramsay, the carrier’s managing director of its integrated operations center. The journey from Brussels took 9 hours and 16 minutes, about an hour more than three months earlier, according to industry data tracker FlightAware. Flights across the Atlantic to eastern U.S. cities in December 2013 averaged 19 minutes later than a year earlier, according to industry data tracker MasFlight.com. Travel times in December 2014 were similar to those in 2013, MasFlight’s data from more than 1,300 flights a year showed. With the threat of increasingly strong headwinds every winter, airlines face higher costs on those westbound flights with the use of extra fuel and the crew’s time. “When you were planning to fly non-stop, stopping for fuel costs money,” said George Hamlin, president of Hamlin Transportation Consulting, who has more than 40 years of experience in commercial aviation and aerospace. The peculiar solar cycle 24 — where do we stand? Solar cycle 24 has been very weak so far. It was preceded by an extremely quiet and long solar minimum. Data from the solar interior, the solar surface and the heliosphere all show that cycle 24 began from an unusual minimum and is unlike the cycles that preceded it. We begin this review of where solar cycle 24 stands today with a look at the antecedents of this cycle, and examine why the minimum preceding the cycle is considered peculiar (§ 2). We then examine in § 3 whether we missed early signs that the cycle could be unusual. § 4 describes where cycle 24 is at today. The minimum that preceded solar cycle 24 was unusual in its depth — the 10.7 cm flux was the lowest recorded, while there were sunspot free days than have been recorded among recent cycles. The minimum was also of a much longer duration than any other minimum in recent history. Other, more recent data sets, such as the Kitt Peak and MDI magnetograms, and they too also show that the polar fields were weak during the cycle 24 minimum compared with the cycle 23 minimum (de Toma 2011; Gopalswamy et al. 2012). The structure of the solar corona was also quite different from what is expected during a normal minimum. As can be seen from the LASCO images shown in Fig. 2 the solar corona has the canonical solar-minimum structure during the cycle 23 minimum, but the coronal did not have a simple configuration of streamers in an equatorial belt as it was during the previous minimum in 1996. The differences between the cycle 24 minimum and the previous ones were not confined to phenomena exterior to the Sun, dynamics of the solar interior showed differences too. For instance, Basu & Antia (2010) showed that the nature of the meridional flow during the cycle 24 …. Daily posted true color view of entire Earth. Visible dust spreading from China eastward is just scary. It covers substantial percentage of Earth area. There are additional dust sources in India, Indonesia and Arabian peninsula. Like many articles here this one lacks both an initial abstract / summary and the final conclusions. Unfortunate since with these things the message would be communicated more quickly and effectively to more people. Say what you have said. WUWT should encourage posters to include an abstract and conclusions paragraph. This is less an article than a presentation/update of the latest data. As is evident from the discussion, there are many ways to interpret. I admire WUWT for not always telling me what to think and letting me think for myself. A summary does not have to force an interpretation. It just means that more people will read it – and understand the author’s point in writing it. Many simply don’t have time for all the minutiae. From the many disparate responses in this thread from (apparent) experts, it amazes me that there is so much reliance on ‘The science is settled’ from the pro-CAGW crowd and that politicians/academic societies can make such certain statements regarding this issue. Are you confident there exists no solar mechanism that could possibly have any meaningful effect on ~cyclical changes in temperature on Earth? To put it another way: are you confident you understand both solar activity and Earth’s climate dynamics well enough that if such a mechanism existed you (or the world) would already have discovered, understood and explained it by now? I understand, by the way, you don’t see such a mechanism and this leaves you doubtful of one’s existence. I’m wondering how foolish you deem it to for others to feel that the case is actually far from closed. You obviously know a lot, but I always have difficulty getting a grip on what your fundamental position is with respect to climate-change-related solar-Earth interaction. Thanks in advance if you take the time to respond. There is [should be] a solar effect of the order of 0.1K over the cycle. Anything larger than that is not obersved. Thanks ever so much for the thoughtful response, Leif. I can feel my enlightenment rising as I speak. “If the dark spots on the surface of the Sun are dark because they are colder than the rest (spotless part) of the Sun’s surface, then why should the Earth warm when there is plenty of “Sunspots”? Is it not more likely that a “Spotless Sun” will send out more energy than will a “Spotty Sun”, thus warming the Earth more? Sunspots are cooler, but faculae more than make up the difference during active phases of the cycle. David forgot to update us on how his prediction for a 2 degree temperature decline over the duration of Solar Cycle 24 is shaping up. Thanks for asking. Of course it is going very well but the result has been a bit more intense and regional than many had thought possible. Specifically it is giving Boston a walloping with a temperature of -2 degrees F as I write this. Boston is now headed for its greatest ever winter snowfall amount. This a result consistent with what is predicted from global cooling. Don’t lose your faith. Of course it is going very well but the result has been a bit more intense and regional than many had thought possible. Do you mean some place have cooled but quite a lot have warmed. Specifically it is giving Boston a walloping with a temperature of -2 degrees F as I write this. I take this to mean that Boston is currently a couple of degrees below normal. This is not a trend, David, it’s simply short term weather. You now seem to be claiming success because some locations (or one at least) are a bit cooler than normal. There has been a sudden and significant slowdown in the solar magnetic cycle. There are in the paleo climatic record cycles of warming and cooling that correlate with solar magnetic cycle changes (both hemispheres). The regions of the planet that warmed and cooled in the past were high latitude regions. High latitude regions warmed in the last 70 years. AGW predicted warming was in the tropics not in high latitude regions. See Greenland Ice temperature, last 11,000 years from Richard Alley’s paper, Bond’s paper persistent solar influence on North Atlantic Climate during the Holecene, and Does the Current Global warming reflect a natural cycle. Based on an analysis of cosmogenic isotopes, solar activity in the late half of the 20th century was the highest in 12,000 years. The high period of solar activity correlates with the period when the planet warmed. Shiva analyzes past climate cycles that correlate with solar magnetic cycle changes and calculates that 0.47C +/- 0.19C of the recent warming can be attributed to the grand solar maximum. Unexpectedly there is now the highest amount of sea ice (all months of the year) in the Antarctic in recorded history and there is now recovery of sea ice in the Arctic. Conclusions: It appears a significant portion of the warming in the last 70 years was due to solar magnetic cycle changes rather than AGW. It that assertion is correct the planet will now cool (up to 0.6C of cooling based on Shiva’s calculation), due to the sudden slowdown in the solar magnetic cycle. …We found 342 natural warming events (NWEs) corresponding to this definition, distributed over the past 250,000 years …. …. The 342 NWEs contained in the Vostok ice core record are divided into low-rate warming events (LRWEs; < 0.74oC/century) and high rate warming events (HRWEs; ≥ 0.74oC /century) (Figure). … ….The current global warming signal is therefore the slowest and among the smallest in comparison with all HRWEs in the Vostok record, although the current warming signal could in the coming decades yet reach the level of past HRWEs for some parameters. The figure shows the most recent 16 HRWEs in the Vostok ice core data during the Holocene, interspersed with a number of LRWEs. …. ….We were delighted to see the paper published in Nature magazine online (August 22, 2012 issue) reporting past climate warming events in the Antarctic similar in amplitude and warming rate to the present global warming signal. The paper, entitled "Recent Antarctic Peninsula warming relative to Holocene climate and ice – shelf history" and authored by Robert Mulvaney and colleagues of the British Antarctic Survey ( Nature, 2012,doi:10.1038/nature11391), reports two recent natural warming cycles, one around 1500 AD and another around 400 AD, measured from isotope (deuterium) concentrations in ice cores bored adjacent to recent breaks in the ice shelf in northeast Antarctica. …. to the above caveats and those described in the text, the CRF/climate link therefore implies that the increased solar luminosity and reduced CRF over the previous century should have contributed a warming of 0.47±0.19C, while the rest should be mainly attributed to anthropogenic causes. Without any effect of cosmic rays, the increase in solar luminosity would correspond to an increased temperature of 0.16 ± 0.04C. William: This paper notes the observed warming is at high latitudes which is not agreement with the general circulation models. If AGW was the cause of the warming the majority of the warming should have occurred in the tropics. Sometimes it takes a crackpot to shout “the emperor has no clothes”. 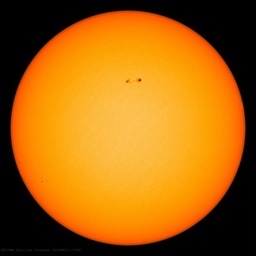 Penn and Livingston, in their September 2010 IAU publication “Long-Term Evolution Of Sunspot Magnetic Fields” predicted that Solar Cycle 24 would peak at an International Sunspot number of 66 and Solar Cycle 25 at 7!! Any update? Amy others who have made predictions for cycle 25? except in this case the emperor does have clothes. The solar cycle is progressing as predicted. The rest of Vuk’s missives are just pseudo science and self-delusions. Someone who compares himself to Bruno, Einstein, and other luminaries deserves no consideration. “Emperor” in Washington must have very thick clothing. Vukcevic equally may turn out to be not right, but if he is right, it will be still dismissed. Dr. Livingston’s was an interesting short term experiment, magnetic events go up and down, as the SC24 picked up so did magnetic field. According to well known Svalgaard algorithm there is a relationship between polar field max and SSN Rmax, it works well as far as it can be assessed from the available data.. If the current polar fields peak at around 50-60 micro Tesla, the SC25 Rmax should be in region of 35-40 which is in line with SC5 & SC6 . Dr Livingston has underestimated SC24, not by much, perhaps it was done using the Svalgaard’s formula, but the. formula can’t be used for SC25 for at least 2 years. I think SC25=7 is well bellow anything outside the Maunder Minimum, and may be a gross underestimation. 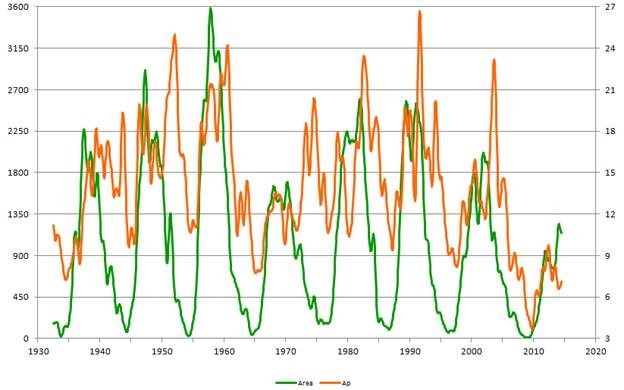 In the comment by William Astley, his graph shows a temperature cycle which averages 1150 years and is not due to peak for about 150 years yet. That cycle is related to other commonly reported 2300 and 4600 year cycles. Dalton Minimum, here we come…..
Looks like we will be cooling down any day now. any day now. . .
SH–> summer to fall to winter…. no doubt. Looks like we will be heating up any day now. NH spring into summer…. no doubt. Don’t forget we’re still waiting for el Ninot. Has anyone done the math, just curious, as to how much warmer the earth should be from 1998. The rate of retained heat was stated as 240w/m^2. Multiply that by the surface of the earth, I am assuming every hour every day since 1998. So about 515 x 10^6 sq. m.. x 240 is about 1.23 x 10 ^11 x 365 is about 4.5 x 10^13 w/m^2 x 24 hrs .. would up it to 1.08 x 10^15 and then the years lets say 15.. 1.62 x 10^16 w/m^2.. .. Using just that number from the IPCC of 240w/m^2 retained, does anybody think it should be a heck of a lot warmer? Now remember that since the rate of co2 in the atmosphere is still increasing, then the rate at which the level of retention should also be increasing. Either the air or the oceans should be a lot warmer… just not hiding. The dire predictions the IPCC made back in the early 2000’s would already be true according to the math. I think that if CAGW were true and the predictions based on the numbers were true, most if not all of us would accept that. Skeptics would be very few in number, and the debate would really be over. It didn’t happen, it doesn’t look like it is going to happen either. No. 240 w/m2 is the average solar insolation across the earth’s surface. It’s nothing to do with retained heat. The current imbalance (incoming-outgoing) is reckoned to be between 0.5 w/m2 and 1 w/m2. Because of difficulties obtaining direct measurements, the imbalance is currently estimated from ocean heating. A Tip: Before labelling any idea as “crackpot” it might be best if you improved your understanding of the issue first. While mainstream climate scientists have probably over-estimated climate sensitivity to rising CO2 concentrations don’t make the mistake of thinking they are complete idiots. No you are wrong. Retained is the exact wording. This is the insanity of trying to talk to CAGW people. I have the exact numbers here from the IPCC and the math. 343 w/m^2 incoming. 240 w/m^2 retained and 103 w/m^2 out going. If these numbers aren’t right, explain to me how the IPCC could make such dire predictions without them? That is the only way that the IPCC could even begin to say that the temp would increase by 2 C by now. Or that the north and south poles would melt. I’m saying yes, with that amount of heat, those things would surely happen. Without out that math and numbers, the IPCC cannot say that co2 has attributed 0.5 C of temperature increase. I didn’t make the hockey stick chart with the temps being flat across the LIA or the MWP to correlate with co2 levels. I do understand the issues. Additionally, since new research has stated that half of the observed warming was due to the release of heat from the oceans, Then how do they justify those statements? Basically, if your saying that those numbers aren’t right, then we really don’t have a problem with co2 and 97% of climate scientist are wrong. There is no way to get to CAGW without it. You can’t downgrade this argument and still claim that co2 is causing global warming. I have extensive amount of data and information from the IPCC and Associates, none of it makes any sense. Much like your reply. If solar activity nosedives over the next couple of decades, what’s the story if global temperature holds steady? Either that solar activity does not matter for global temperature, or that CO2 does? Could you show the error bands for the pre-1860 to present global air temperature? I’m thinking that -.4C falls within a very wide margin of error. As the temperature data is not mine, I can’t really do that. You can probably find such information elsewhere. Good question, however I am the original Jim G so would request that you change your sign on to Jim G1 or something else or I will. Let me know. I haven’t posted in awhile, however, I have been visiting these boards since about 2008. Claiming originality to a common name is rather dubious. I apologize for not calling you on it back then. Won’t argue the point since you consider it “dubious”. I am now Jim G1. And clearly, a gentleman as well. I’m guessing that I’m a bit late for this to matter to anyone, but this graph does show the HadCRUT4 error bars all the way back to 1850. The bounds are, according to Met-Hadley, 95% confidence bounds from all sources of error — model, bias, and measurement. I am deeply skeptical, of course, that these error bars are at all reasonable. According to Met-Hadley, the error in the global temperature anomaly in 1850 was around C. In 2014, it was around C.
To put this in simple terms, if we assume nothing but the expected error from averaging over N measurements, not taking geographic coverage, systematic bias, missing data, the UHI effect and model errors into account, to halve a normal error require 4x as much data. They are, therefore, effectively asserting that there are only 4x as many independent samples contributing to the 2013 average compared to the 1850 average, and this is truly absurd. Note that the contributions from vast undersampled portions of the globe — like most of the Arctic and Antarctic and Australia and Africa and the Americas and even much of Asia — ooo, and let’s not forget the oceans — back in 1850 that have to be infilled and kriged and smooted and interpolated strictly and nonlinearly add to the expected error relative to pure gaussian scaling from presumably independent samples. Then there is the obvious fact that the samples they have are not independent — they are highly clustered and located predominantly where humans live, meaning that they are hardly random samples drawn from a hat containing all of the surface points on Earth, uniformly distributed. This too increases expected error relative to a normal. And this is before accounting for bias and model error. HadCRUT4 includes separate line entries for three categories of error — bias, measurement and uncertainty, and model error. In 1850 their measurement error alone is given as ~0.038 C. In 2014 it is given as ~0.036 C. Both of these numbers are utterly absurd. We couldn’t measure the average temperature of my back yard to 0.038/288*100 = 0.0125% relative accuracy over the course of a year. Then there is the treatment of systematic bias — oh, wait, HadCRUT4 doesn’t correct for UHI, I forgot. Then there is the utter neglect of the probability of systematic shifts in recording procedure like those that Lief has tediously corrected for in the sunspot record. Lief has the advantage here — he has access to superbly correlated proxies of solar activity that were measured to very high precision and consistently back over the period where sunspot observation methods were discretely changing along with the observers, and he had to correct for only a comparatively few observers. The thermometric record is essentially uncorrectable, as any proxy used to correct it is going to have even worse resolution than thermometers, and thermometers are already susceptible to numerous sources of potential systematic error that, at this point, we could not possibly correct for. All of this increases the uncertainty at best, and the neglect of UHI correction simply makes the numbers nearly meaningless as they could be precise at the levels indicated and still be significantly in error due to UHI. It is telling that HadCRUT4 considers errors from bias and model uncertainty to be greater than pure measurement error, the precision of the basis for their model computation of the rest. Yes, they explain what their errors are based on in their documentation, but that doesn’t make them actually representative of probable error in the numbers themselves, or reasonable. To conclude, C is right at the asserted level of 95% confidence for HadCRUT4 as of earlier this year when I downloaded their dataset and description. In my fairly well-founded opinion, this error estimate is absurdly low for 1850, simply because in 1850 some 2/3 of the planet was Terra Incognita as far as any sort of systematic measurement of temperature with reliable instrumentation and methodology is concerned. The “hot spot” in the Pacific, for example, that de facto boosted the planetary anomaly this year would not have been observed at all. El Nino’s and La Nina events would not have been observed — they were not observed and officially recorded or studied until 1893, and our knowledge of them prior to the 20th century is almost entirely inferential. All of this is further evident in our inability to produce the actual global average surface temperature to a precision greater than 1 C now. Different models produce that large a spread, and the likely error is larger than the spread itself given the relatively small number and lack of independence of the models. One then has to rely on a complete lack of drift in methods that compute an “anomaly” relative to a modern baseline, and all such methods inherit at least the error in the baseline temperature, and are further confused by the fact that the baseline is not the baseline average of a stationary process. A single metaphor to illustrate — if one infers flood or drought by measuring the depth of a river relative to a “normal depth” baseline, one gets reasonable numbers as long as the river stays in between its normal, comparatively steep, banks. However, once the river rises to where it spills out of those banks, the water spreads out over vast plains and stops rising proportional to the flood. Similarly, once the river shrinks to where it leaves the steep sides, the assumptions of linearity no longer hold. Computing flood anomalies now compared to flood anomalies in the 19th century require a fair knowledge of how the entire topology of the river basin has changed in the meantime, because these things are not stationary. Similar things affect e.g. tidal gauge records — in the Outer Banks where I live in the summer, violent weather periodically reshapes the entire coast and sound depth, which in turn have a nearly unpredictable effect on the tides measured even at sites where the gauge has sat for a century. Many other things have an effect as well. No matter how pristine the data, one cannot reliably compare the anomaly of even a single, unaltered tide gauge now to the anomaly measured 100 to 200 years ago as being truly representative of the alteration of the mean depth of the ocean. One can try to correct for some of this, but in honest statistics the corrections come at such a high price in assumptions that they don’t really alter the error bars much. Information theory — ignorance is ignorance — information entropy — and one cannot reduce entropy by wishful thinking or a guess. Consequently, I do not have much confidence at all in the global surface temperature anomaly estimates. I think that they understate their probable error (which is already rather large compared to the total change “observed” by the models that produce them) by at least a factor of 2. I do not think that our knowledge of the anomaly is any better than our knowledge of the mean temperature itself, order of C, over the entire 19th century and is only very slowly decreasing in the 20th century until the advent of satellite measurements and ARGO. Post-1980, I think our knowledge is pretty good. Post 1950 it isn’t terrible — WWII and the subsequent cold war brought about military measurements, at least, of the entire globe from roughly this period on. Before that it blurs, then blurs some more, to the point where we might as well use tree rings as thermometers by the middle of the 19th century, where neither one of them has any global precision worth mentioning. The solar cycle is progressing as predicted. Thanks doc. No doubt, up to this moment indeed it does, future is uncertain as ever. ‘vukcevic’ is just as surprised as anyone else that his formula works so well! The rest of Vuk’s missives are just pseudo science and self-delusions. As years go by, failing to overturn the formula’s accuracy (and there were number of unsuccessful attempts) by now only ammunition left is just few papier-mâché blanks, ‘pseudo science’ and ‘self-delusions’, ‘man of superior ignorance’, ‘danger to society’, notable ‘D&K syndrome’ exponent and whatever else is left in the arsenal of feeble insults. Man come up with something stronger. This type of commentary indeed may sway a few, it is a method, admittedly employed with some success by the AGW promoters with their ‘think-lite’ beverage recipe. Someone who compares himself to Bruno, Einstein, and other luminaries deserves no consideration. Evidently ‘vukcevic’ is not Giordano Bruno, fortunately neither Dr. Svalgaard is the pope Clement VIII. When in Rome visit Campo de’ Fiori. We all know about Galileo, who at the last moment denounced himself, but Bruno did not. Do not expect Vuk to give up in face of few paltry and worthless little ad hominem. Of course burning at the stake would be another matter; there I think following the Florentine would be vastly preferable. ‘Einstein’ is your mistaken embellishment. Not my hero. His Nobel prize was nothing to do with the theory of relativity, it was based on the work of his ex-wife, a brilliant mathematician Mileva Maric (Einstein failed his exam), he apparently gave her half of the Nobel money to keep her quiet. And finally, there is a small matter of crackpot, if you unable to disprove something, fling an insult or two, it is an easy way out, it may work with some, but there is always the ‘boomerang effect’ to consider. Science is fun, if you can’t enjoy it go and do something else. vukcevic’ is just as surprised as anyone else that his formula works so well! As you well know it doesn’t work at all. A ‘prediction’ of the formula is that there will be no polar field reversal in the next cycle and also not around 1900. But we know that the polar fields did reverse a century ago. To expose pseudo science for what it is is a duty of every scientist [as it is indeed a danger to society] and you will not escape exposure. Science is fun, pseudo science is a cancer. But we know that the polar fields did reverse a century ago. Now scientist is talking science, instead throwing paper darts, with childish discourteous comments. –	No, we don’t know that, we are guessing that could have been the case. Polar fields measurements started in 1960s, Russians done some a few years earlier, but that was long after 1900s. –	You might say, the magnetic needle (better known as compass) deflections shows that it did. No chance !!! Polar fields at their strongest as measured around 1975 were estimated to be around 300 microTesla. Magnetic field of the sun as any other falls off with the square of distance. Sun is 149,600,000 km away, no magnetic needle located on the earth can tell us what is the sun’s polar field doing. and it is to your CREDIT (I fully acknowledge that) to bring the horizontal geomagnetic component to the science’s attention, you should have done more there, the climate link in the N. Hemisphere is strong. –	And finally, it is not true that formula doesn’t show polarity reversal (if extrapolated back to pre 1900), the reversal is there, but it lasted just about a year, as it may happen around 2024-25, see you then. No, we don’t know that, we are guessing that could have been the case. Zoom in on 1900 (enlarge the graph) and you can see folly of your claim ! The polar fields determine the size of next 11-yr solar cycle[which in turn determine the next polar fields] and the sign of the Hale polarity law and no 1-yr cycle can result [it takes time to make a cycle]. A 1-yr cycle is a good example of pseudo science [and of science illiteracy]. Since you are not going to do it, here you can see there was a reversal in the early 1900s ! Quoting yourself to support yourself is fine, if you have valid data for 1900s. As I said above the East component of the geomagnetic horizontal field, derived from compass readings is by no means a measure of what solar polar field is doing. The daily variation of the East component has indeed nothing to do with the polar fields, but geomagnetic activity as measured by the aa-index or ap-index [or similar] does depend on the polar fields. Your confusion about this just shows how little you know about this topic. So, pay attention and learn. Hey, wait a minute I didn’t say there was a one year cycle. It more smells of ‘pseudo science [and of science illiteracy]’ to extend the what is happening currently into the past for which we have no data. Sun does strange thing every 100 or so years. You claimed on numerous occasions that you and no one else knows why, it is best to stick to what you claim as you know to be it, else tell us why SSN dips once a century. If you accept my hypothesis that it is planetary feedback, I am more than happy to discuss merits of it or otherwise, else you are just squandering your valuable time. But in any case you get the polarity wrong. We know that the polarity in the 19th century has followed the same pattern as during the 20th, so no mini-cycle in 1903. As I said, your formula does not hold up [which is not a surprise]. extend the what is happening currently into the past for which we have no data. But we do have data that shows that your polar fields signs are wrong before 1900. Can we have it ? or at least link to a data file, not some fuzzy -wuzzy assumptions. Data is the King ! No data no contest. Can we have it ? E.g. Can we have it ? But you can convince yourself by simply using the aa-index which shows the 22-yr cycle. No ‘new’ data is needed. A big mistake is to try to predict future solar activity based on past solar activity from 1845-2005 when the sun was in an active overall mode in contrast to an inactive overall mode post late 2005- present. As evidence for this is the change in the AP INDEX VALUES, post late 2005 in contrast to the period 1845-2005. The AP INDEX during that long period of time (1845-2005) comes in at an average value of approximately 14 , in contrast to the AP INDEX smoothed monthly average value of around 7 from late 2005-present. That is approximately a 100% decline! If this were not significant enough the data below supplied by William Astley , is even more telling. It is telling us which I have maintained all along that sunspot numbers do not tell the whole story of how variable or not the sun may be. In addition one can see the correlation between solar geo- magnetic activity and sunspots is not holding up very well. I believe solar geomagnetic activity has a threshold value that if attained (AP INDEX 5 OR LOWER ) will have a significant impact on the climate for it will be able to over come much of the noise inherent in the climatic system. Threshold values are vital and once crossed that is when correlations are seen whereas if not crossed correlations from a particular force can be obscured by noise and other forces in the climatic system which can cause counter trends in the climatic system to what that particular force is exerting. Which for some reason does not seem to register with some that keep posting to show solar/climatic correlations do not exist. They just do not understand the complexity of the climatic system. ” The AP INDEX during that long period of time (1845-2005) comes in at an average value of approximately 14 , in contrast to the AP INDEX smoothed monthly average value of around 7 from late 2005-present. Are you sure it’s not a 50% decline? The data from above shows a significant decrease in the spread and variation in degree of magnitude of the solar polar fields post 2000 (and especially post 2005 ) versus the period prior to that time. Another indication that solar activity post 2005 versus the period before is not the same. The data is telling me this. I am not making it up out of the thin air. This is from Weatherbell. It shows they have been using solar/lunar analogs to predict winters and this has been when solar activity was not in the prolonged minimum phase it is now in. To many this little ‘disagreement’ of an amateur with Dr. S may not be of much interest, but occasionally Dr. S comes up with a ‘gold nugget’ and should be credited for it. But what I hope you can clearly see is: the Maunder Minimum, Dalton Minimum, early 1900s minimum, and finally the forthcoming minimum. We do have data before 1960s, e.g. http://www.leif.org/EOS/Polar-Fields-Faculae-Andres.pdf and the geomagnetic 22-year cycle back to at least the 1840s. As everyone can see from the figure you reproduce, you get the sign of the polar fields wrong every 100 years. That is why your formula and its underlying hypothesis don’t work. When data we do not like, we claim no evidence. Your mistake is to believe that those phenomena are in any way related. So, say no more. Now you claim that they influence the Earth’s core. Pseudo science at its worst. Earth’s core magnetic field data (Jackson, Bloxham & Gubbins) shows 22 year cycle. Only a full could claim that the sun’s polar field of few hundred microTesla at a distance of nearly 150 million km would move the earth’s core field. The polar fields are responsible for the sign of the 22-year cycle of geomagnetic activity [as any fool can see] and control the size of the heliospheric magnetic field at low solar activity. Geomagnetic storms are not controlled by “Energetic charged solar particles”, but by the magnetic field from the Sun interacting with the Earth’s magnetic field. None of these have any influence on the core field. Oh yea, yea sun’s solar polar field of 2-3 hundred microTesla at best, at a distance of nearly 150 million km makes Earth move. The flux ropes don’t make the Earth move either. In both cases the magnetic field is the agent. At solar minimum the polar fields supply the HMF, at solar maximum, the flux ropes add a similar amount. The flux ropes provide the rest. Educating you [if that is possible]. Flux ropes are also a few nanoTesla [e.g. http://hirweb.nict.go.jp/sedoss/solact3 ] and they are intermittent so their average effect is comparable to the background few nT. Seen as the Earth uses the solar particles. Low solar activity and the strong response of the magnetic field. So, as I said, the formula and the hypothesis are no good. 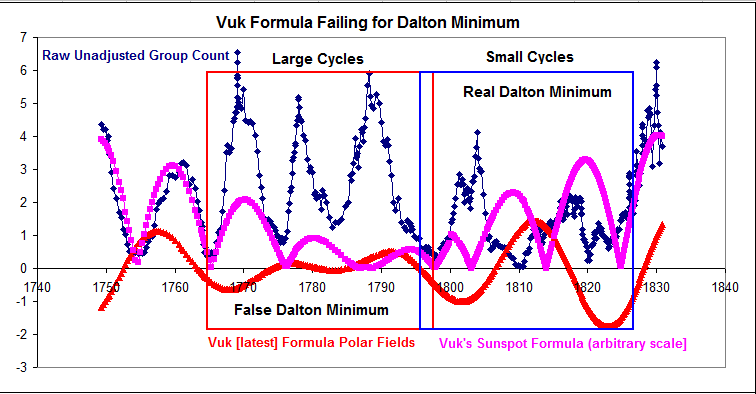 Shows clear that you are two solar cycles out of phase with the Dalton Minimum, and also for the 1900-minimum. So, again, the formula and the hypothesis are no good. I am glad Leif ,just sent his latest chart. ( the real data probably a blend of this and what was earlier thought which does not matter.) What matters is the strong correlation which I pointed out earlier between the solar secular cycle (the black line) and global temperature trend and absolute global temperatures. 100 is key , which when broke on the down swing ,global temperatures trend down and on the upswing global temperatures trend upwards. It looks like the 100 value line has been broken around 2010 which is the first time since approximately 1830 which is when the Dalton Solar Minimum ended, and the solar secular cycle line crossed that value on the upswing and the temperature trend followed in an upward trend. Note how high this value has been from 1930-2005 ,and note the global temperature trend. The global temperature trend should be down from here to 2020 and probably beyond if solar minimum activity materializes the way it could very well do which I think is very possible. Except that Vuk’s formula does not get the timing right. E.g. for Dalton is two cycles wrong. 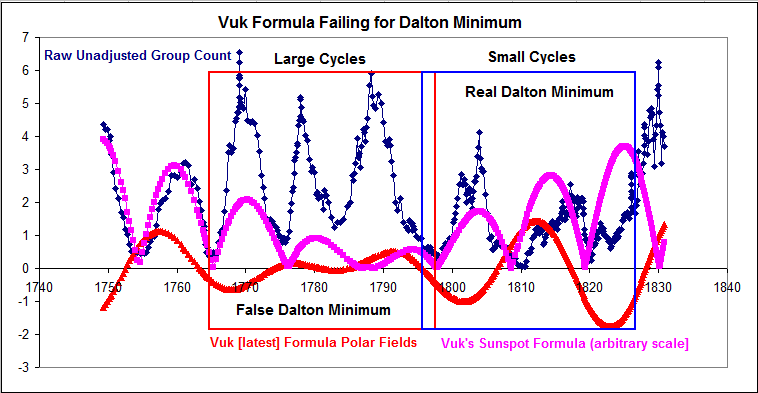 Your own graph shows the Dalton Minimum from 1790-1830. No, from 1798 to 1825. Vuk’s formula has it from 1765 to 1805, 20-30 years off. Vuk’s formula has it from 1765 to 1805, 20-30 years off. There was no small cycle 4a. Regardless of what Usoskin thinks, see http://www.leif.org/EOS/j143-Lost-Cycle.pdf and that still does not help you being off by 20 years for the Dalton Minimum. What I see from this data is Maunder Minimum around 1660-1705, Dalton Minimum from around 1790-1830 a slightly weaker period of solar activity from 1880-1910 and then rather strong solar activity from approx. 1930-2005. I see what you are saying, but I am going by your data Leif. What Dr. S is trying to do, is to use extrapolated polar field for which we have no data before 1969’s instead of the sunspot numbers for which we have data. See February 16, 2015 at 10:23 am above. We DO NOT KNOW what polar fields were doing before 1960s ! Actually the Babcock’s measured the polar fields in 1952, but the other indicators are valid as we understand the physics involved, See: http://www.leif.org/research/Asymmetric-Solar-Polar-Field-Reversals-talk.pdf . Here you can see the predicted distribution versus the observed [when the effect is large enough to be unambiguous: http://www.leif.org/research/22-yr-Cycle-in-Geomagnetic-Activity-png The colored circles indicate the polar field polarity. Indeed you are wrong. And changed your formula to boot. Clearly Vuk’s formula is no good. so what? it is still wrong. Vuk, what years do you think the Dalton Minimum occurred in? From when to when? I think it is 1790-1830. I would equate the year 1790 as being approximately equal to current conditions today, in relationship to when the next minimum will set in. I would call this pre-minimum conditions. My expectation is that 2017 will be the kickoff year. In the top panel you have SIN for the blue curve. In the bottom you have COS.
You cant help yourself writing nonsense. It would help if you read what is written rather than squandering time on your nonsensical graphs. It doesn’t do any good to your reputation making up things. Over 70% of the Earth surface is covered by the ocean, preferably at lower latitudes. It can be reliably estimated, that – due both the geographic distribution of the ocean on the surface of the Earth and its extremely low albedo – about 90% of all the solar radiation reaching and absorbed by the surface of the Earth and converted to heat is absorbed by the ocean. The ocean mostly is liquid water. Some of the liquid water optical properties (reflectivity, absorbtivity) are EXTREMELY wavelength dependent – e.g. the difference between the water absorbtivity in the visible vs. UV and IR regions is couple of orders of magnitude. The solar spectrum peak region happens to be almost same as the water absorbtion spectrum (google: Absorption_spectrum_of_liquid_water.png) low (it is merely a coincidence). Therefore it looks that even a slight solar spectrum composition change should significantly change the total amount of the solar energy which is absorbed at the Earth surface and converted to heat. Such spectral shifts due to the changes of the solar activity during the solar cycle and very possibly beyond are very strongly suggested by the SORCE satellite SSI data (see Ermolli et al 2013) – Even if the TSI stays completely flat, if the solar spectrum composition changes the amount of the solar radiation absorbed by the ocean and tranformed into the heat content there per unit of time can significantly change, especially if the solar spectrum composition change trends in some way over longer periods of time than one solar cycle and the heat content there accumulates or dissipates. In terms of energy carried the most significant region of the solar spectrum reaching the surface of Earth is the visible region. The SORCE data suggest that the total energy carried in the visible region of the solar spectrum (and also SWIR region) very significantly RISES during the solar cycle MINIMUM period while the energy carried in the UV (and only fraction of it reaches the surface of Earth due to its absorbtion in the atmospheric ozone layer) and NIR regions significantly declines and therefore, if the SORCE SSI data are right, the models trying to link the TSI and the global surface temperature changes are obsolete. If the SORCE SSI data are right it clearly couldn’t work so simply like that. In such case we would need to have quite longer than one solar cycle SSI dataset for deciding the question whether the solar activity changes are or aren’t responsible for the global average Earth surface temperature changes. Without it the claims that the solar activity changes do not have anything with the GW observed in the past or the claims to the contrary would be scientifically more or less unreliable and baseless. Quite right. But the pronounced UV flux variability can also affect climate. Changes in the UV flux marking the solar cycle certainly play its role in the climate, no question about that and the question is only how much, however due to the higher atmosphere effectively absorbing large part of it such UV intensity changes only partially reach the surface of Earth. Also as the reanalysis of the SORCE SSI data show (for quick comparison see the figure 2 in the Ermolli et al 2013 – http://www.atmos-chem-phys.net/13/3945/2013/acp-13-3945-2013.pdf) its share on the ΔSSI/ΔTSI is considerably lower than previously calculated (although still higher than previously measured in other solar spectrum researches) and is more or less on par with the opposite changes in the visible region. On the other hand most of the visible region of the solar spectrum reaches the lower troposphere, with clear sky the surface of the Earth and even penetrates relatively deep into the ocean (orders of magnitude deeper than the UV and IR) even at very high incidence angles (because the index of refraction of water is much higher than that of the air and also because there is waviness on the surface of the ocean, relatively lowering its reflectivity considerably and especially near terminator) where it is almost fully absorbed and converted to heat. After first seeing the SORCE solar spectral irradiance data results in the Ermolli et al I was very intrigued by it, especially by the paradox behaviour in the visible region, suggesting strongly it is not so simple with the solar irradiation intensity as it so far looked and due to my previous research into the ocean insolation I have immediately suspected that such spectral shifts could interact with the extreme optical properties of the water in the ocean on such magnitude and amplify the effect in such manner that it would be a big game changer for whole the quest for the solar activity – surface temperature link. So I was deeply looking into the data and the issue trying to replicate Ermolli et al results – which more or less I now confirm – at least for the UV, visible and NIR regions (for the SWIR there are some startling artifacts in the data which unfortunately make it unreliable enough for me to be able to confirm the results fully and I unfortunately haven’t succeeded to resolve this problems with the LASP – the SORCE satellite program coordinator). When I’ve applied the results to my working finely grided (1°) empiric ocean insolation model assuming for the moment that such changes counteract the changes in the UV spectrum in order suggested by the relatively still short SORCE SSI series I came to the conclusion that in such case the presumed higher intensity in the visible spectrum during the solar cycle MINIMUM periods of the last couple of solar cycles could explain the the 1970-1990s warming period, because it would both by the principle and order of magnitude explain the reason for the rise of the ocean heat content (the ocean is carrying by far most of the heat content at the surface of Earth resulting from the solar irradiation, order of magnitude more than land and atmosphere combined, not speaking about its tiny CO2 content…). To reliably confirm such conclusion empirically I would need considerably longer SSI data series than the data acquired by the SORCE satellite. But in any case, because the liquid water optical properties have such a potential to amplify the solar spectral irradiance changes influence on the ocean heat content distribution throughout the epipelagic zone of the ocean and its total amount coming to the existence over a unit of time, I now strongly believe that if there will be a physical link between the solar activity changes and the global average surface temperature changes confirmed in the future it will be by the SSI not TSI and it will be more due to the spectral composition changes in the visible (which reaches lower troposphere and surface of Earth almost unipeded and mostly gets absorbed and converted to heat there in the depths of the ocean epipelagic zone), than UV regions of the solar spectrum. I can be of course mistaken, but after looking into the solar data for years including the spectral data I’m almost sure the future research will confirm this my “prophecy”. I strongly think that this is not a layman blablabla ad hoc choosing a belief but based on years long deep looking into the actual solar data including the most recent ones so far looking to have a potential of causing a fundamental paradigm shift in the understanding of the solar activity – climate link. So, you agree that Vuk’s formula has failed. Yes, because the Dalton Minimum did not occur where the blue box is. cor where the red box is. Take a good look at Fig.1. Dr. S graphs are nonsense. Still wrong, unless you are referring to your formula. No I was not referring to my formula, I was referring to the little green man from Mars. Question IF (a big if) the AP index stays at these levels or goes lower from here and IF(a big if) the polar fields stay as is what would that be indicating to you, besides weak solar activity? Leif ,that question is for you? As geomagnetic activity usually rises to a [perhaps second] maximum some years after solar maximum, I expect Ap to go up. The polar fields will also increase as it usually does until about three years before the next minimum, so I don’t see anything unusual. Let us leave it at that for now and see, since that has occurred in the past. The past is often a pretty good guide for the present and the future. You are welcome to make your own mind, I do not intend to deal any further with continuous stream of this made up nonsense. As is clear, your correlation [both in my rendition and yours] fails for the Dalton Minimum. So, your formulae are no good. So, your formulae are NFG. I just wonder why do you persist with that utter rubbish, it is an embarrassment. And here is screen-shot of what the Excel makes of it (just done). You will persist with a nonsense and innuendo. You can not read, can you? Only difference is a phase shift 2pi/3 (120 degrees) instead 2pi/4 (90 degrees), it can be either, to be determined for the best phase coincidence. But what about your embarrassing rubbish, if I were you I would remove it from http://www.leif.org/research/ website, before too many people see it. Reducing selected sunspot numbers by 20% is just fine. I sincerely hope that your calculations for so called ‘corrected’ sunspot numbers are a bit more sound than reproducing my formula. No surprise no one wants to know Svalgaard’s ironed out solar cycles. Heh, listen who is talking? That was just quick test to show that you were plotting an ‘embarrassing rubbish’. But even if I did change something, it is my formula, my property not yours. In contrast, you go around changing other peoples data, internationally accepted to be good for many decades, collected day by day, by dozens if not hundreds of dedicated people, just to suit some god knows what agenda. So, Vuk, since you change formulae as the wind changes you could cut through all that by simply reproducing this Figure with what you think is your best SSN and PF formulae. By the time you finish fiddling sunspot data, a strait horizontal line will do just fine. Have you ever offered your services to the global temperatures record keepers, or maybe they turned you down, it is an exponential (hockey stick) line they need. It is past midnight here, good night doc! It would be appropriate for you to do what I suggest, if you are man enough for it. There is no way of sensible discussion between those who will insist on settled science and those genuinely interested in the events cause-consequence relationship. This is particularly obvious with the CAGWs and in great measure with the solar scientists. Solar scientists insist that Babcock – Layton hypotheses from 1960s is cast in concrete. It states that polar fields drive next sunspot cycle, (based on probability of 1 in 100 of dead spots generate polar field, which then drives next cycle – ?!) , and the relationship between two is permanently fixed. Up to date we have just about two polar field cycles (with a rather fuzzy start in the 1960s). Question is could a solid theory be built on historical data of just tow cycles? I doubt it. Why? You may ask. 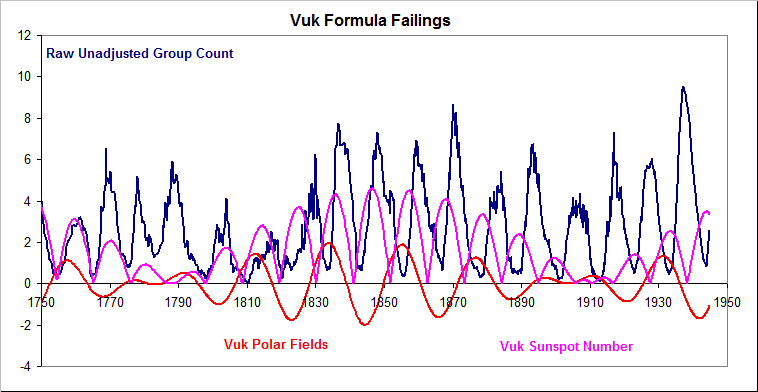 Because it appears that the ‘fixed’ relationship between sunspot cycles and polar fields is heading for the breakdown ! Here SSN a PF are plotted on the same scale, where SSN is moved so it follows polar fields by about 5 years, as ‘settled science’ would have it, whereby polar field max is a measure of the next sunspot cycle max. There is a possibility, as we head on towards the forthcoming Grand Minimum that the breakdown of the phase relationship between sunspot and polar field cycles is the cause of the regular occurrence, about every 110 years (1690, 1800, 1910, 2020) of the pronounced sunspot minima. Science modifies hypothesis and theories as to fit not only existing past but contemporary acquired data. Anti-science modifies past data to fit contemporary ‘politically correct’ inspired views. Altering past sunspot records belongs firmly in the anti-science classification. p.s. If the relationship between polar field and sunspot cycles regularly or occasionally break down it is a folly to attempt to derive one from the other. To have a sensible discussion about science you need to know something about the science, and since you don’t, it is indeed hard to have a sensible discussion. There are no indications that the relationship between polar fields and sunspot cycles are breaking down, on the contrary it is helping to understand the solar dynamo. The [long overdue] revision of the sunspot number is a necessary step in the understanding and prediction of solar activity. You accuse Hoyt & Schatten of anti-science because they introduced the Group Sunspot Number which disagreed with the ‘precious historical data’. There are no indications of any breakdown. The cycle is formed from the dead remains of the previous cycle by dynamo amplification inside the sun. This is well-documented and understood, e.g. You explicitly proved my point. Look at right –ward inclination of your arrows; it has gradually moved from 90 degrees in 1970 to 45 degrees in 2007. It means that the two relevant oscillation are moving out of a quasi-phase, or simply the relationship is not fixed, i.e. it is heading for breakdown. Nonsense, there are not ‘two relevant oscillations’, but rather a single phenomenon: the self-sustaining dynamo converting poloidal fields to toroidal fields and back again. I take it that you did not bother to study http://www.leif.org/EOS/arnab-dynamo.pdf Do so, before putting your foot in your mouth again. As Al gore is reported to have said: “if you don’t know anything, everything is possible”. This seems to apply to you as well. It contradicts the magnetic amplification (false) hypothesis. Further the ‘dead’ spots (?!) sink, stronger the amplification by the internal dynamo, longer they take to resurface as the new ‘resurrected’ magnetic giants. Implication: Longer cycles should be stronger not weaker. Another ‘minor’ problem is the physics of this ‘magic’ amplification phenomenon, turning weak magnetic field of few microTesla to n x 100,000 microTesla or up to 5 orders of magnitude – a true miracle if ever there was one. The amplification follows from Faraday’s induction law and the value found is just what the solution of the equation gives us. That you do not understand this does not mean that it isn’t so. Vukcevic with every month your rule increasingly confirmed and it is without discussion. No, it just says that the calculations are constrained by the observations of a real-world phenomenon, as all theories must be. Time will tell as the data comes in from this current cycle going forward. Context. The relation between solar surface rotation and sunspot activity is still not fully resolved. 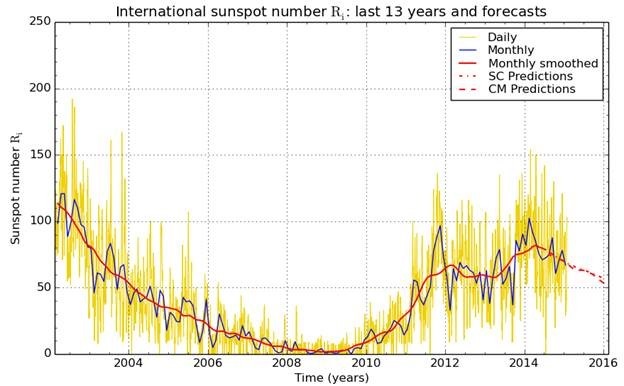 The sunspot activity has been significantly reduced in solar cycle 24, and several solar activity indices and flux measurements experienced unprecedentedly low levels during the last solar minimum. Aims. We aim to reveal the momentary variation of solar surface rotation, especially during the recent years of reduced solar activity. Methods. We used a dynamic, differentially rotating reference system to determine the best-fit annual values of the differential rotation parameters of active longitudes of solar X-ray flares and sunspots in 1977–2012. Results. The evolution of the rotation of solar active longitudes obtained from observing X-ray flares and sunspots is very similar. Both hemispheres have increased their rotation rate since the late 1990s, with the southern hemisphere rotating slightly faster than the north. In the 1980s, rotation in the northern hemisphere was considerably faster, but it experienced a major decrease in the early 1990s. On the other hand, little change was found in the rotation of the southern hemisphere during these decades. This led to a positive asymmetry in the north-south rotation rate in the early part of the time interval studied. Conclusions. The rotation of both hemispheres has been speeding up at roughly the same rate since the late 1990s, with the southern hemisphere rotating slightly faster than the northern hemisphere. This period coincides with the start of a significant weakening of the solar activity, as observed in sunspots and several other solar, interplanetary, and geomagnetic parameters. I have a question about the 2002-2011 SORCE TSI and TOA radiation data previously downloaded. (Several years trend significantly (visibly) “out-of-normal” for 5 and 8 day periods, when plotted against the rest of the years for the same day-of-year. What is easiest for you to see the plots showing these periods: here (on this thread), by email directly, or as a posting to your website ( lsvalgaard.wordpress.com ). The website does not receive much traffic, and so does not appear to be monitored frequently. Note how TSI in cycle 24 has risen well above the 2003-2005 level [as we would expect] invalidating the ill-fated Evans analysis so much discussed on WUWT. I don’t know what you mean by “Several years trend significantly (visibly) “out-of-normal” for 5 and 8 day periods, when plotted against the rest of the years for the same day-of-year”. If you have something to show for it, WUWT is a good forum. Process. The SORCE data was combined into one plot by day-of-year. It produced a very smooth wave, which curve-fitted nicely.. with a few exceptions. When I looked at teach “bump” in the otherwise very smooth curve, single year periods were very apparent: 5 to 8 day periods were distinctly lower (or hoigher) than the other 10 years for the same point in the orbit. Figured I’d ask you what was the cause, if not simple instrument variation. Or if it has been questioned before. Residuals after curve fit of data. Days 0 – 50. One very evident “bubble” -Surely the sun didn’t “go dark” for a little bit? Boggers! I dislike the distractions of tinypics! The “bubbles” are due to the passage of large sunspots. Here is TSI [and other indices] the past year http://www.leif.org/research/TSI-SORCE-Latest.png Note the large dip caused by Active Region 2192. Thank you for the quick check, the quick reply. On the other hand TSI is down when F10.7 is high, …..
One should always view any comment ‘with great skepticism’, especially the likes of your comment.